A breakthrough for business leaders, executives, entrepreneurs, public servants and community leaders. Learn how to become the dynamic and powerful speaker you have always wanted to be with NO FEAR. Does the idea of public speaking make you break out in a cold sweat and want to run as far from a podium as possible — or do you see it as an exciting opportunity to inspire and influence others through the artistry of your speech? 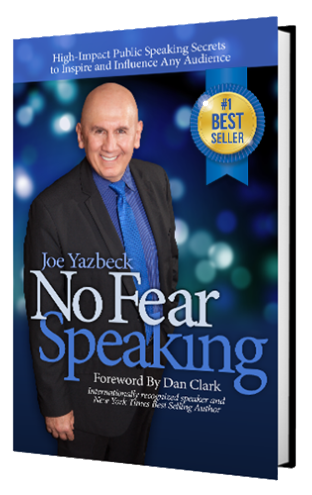 In this book, longtime master speaker, coach and creator of the No Fear Speaking System, Joe Yazbeck, will show you step-by-step how to prepare, organize and deliver powerful presentations as you master the artful science of public speaking to inspire and motivate any size audience for any purpose. Why are people so fearful of public speaking? Why audiences seek speakers who are authentic human beings vs. slick and synthetically polished. Whether you are speaking to influence large groups, presenting to win a sales contract from a small group, or on the public speaking circuit, you will find that No Fear Speaking offers a wide variety of innovative tools, useable tips, and resources to help you become a more dynamic and commanding speaker. With No Fear Speaking you’ll discover how easy and natural it can be to inspire and influence any audience! 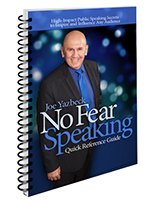 Joe Yazbeck, creator of the No Fear Speaking System, and Founder of Prestige Leadership Advisors and Heartbeat Productions, Joe has enjoyed over 30 years of developing talent in business and the arts. 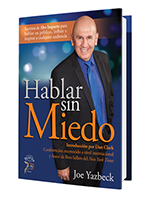 Joe continues to dedicate his energies to speaking internationally and providing professional training for leaders globally to communicate confidently and lead effectively. 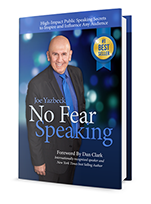 Readers are raving about Joe's best-selling "No Fear Speaking"
Click to read tons of rave reviews by readers of the book. The successes and wins that these people have accomplished is testimony to the effectiveness and workability of the methods Joe Yazbeck has developed, that can turn YOUinto an amazing and riveting speaker. 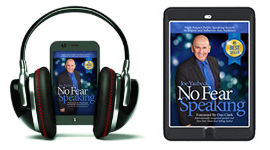 "No Fear Speaking" has been released in SEVEN different languages! 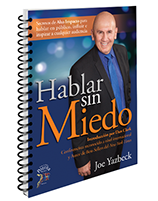 Joe's public speaking tours across the U.S, Canada, Mexico, Europe and Russia are hugely popular and very well attended. 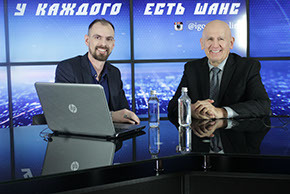 He has appeared on national TV programs in over 9 countries. Click to watch video excerpts from some of these events. Available in hardcover, paperback, audiobook and e-book formats: English, Russian, Slovak, Hungarian, German, Spanish, Mandarin and Czech. What are the 5Cs of a Commanding Speaker? What is Magnetism and how is it acquired? Does your job, career and income depend on you being a confident and commanding speaker? Click to buy Joe’s bestselling book, now available in 7 languages. Available in different formats for each language.